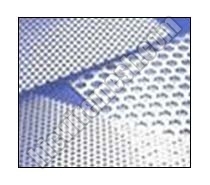 Perforated sheets are available in various patterns, thickness and materials. Perforated patterns consists of round, square, slotted and other custom designed patterns. Various metals can be perforated including mild steel, stainless steel, brass, aluminum, galvanized iron etc. Perforated metal has many applications, including screening, ventilation, protection, or decoration and offers a wide selection of hole sizes, gauges, shapes and materials. Perforated Metal: Features Lightweight Versatile Attractive Economical Easily customized Wide range of open area Suitable for decorative applications Stocked in a variety of hole patterns, gauges, and materials. Perforated Metal : Applications Screens Diffusers Guards Filters Ornamental Uses Light Fixtures Grills Acoustical Panels Baskets Architectural Accents Vents Enclosures Sorting Partitions Infill Panels Strainers Racks Display Fixtures Litter. Bins Perforated Metal : Services We offers cutting services for any perforated metal product. Cutting charges vary according to the number of cuts. Perforated Metal : Alternatives Depending on your application, you may be able to substitute other products for perforated metal products.